Kiewit-General Joint Venture was the construction grand award winner for the $388 million Hood Canal Bridge retrofit and east half replacement. Kiewit-General completed the six-year project ahead of schedule. The Associated General Contractors of Washington honored some of the state’s most successful projects at its Build Washington Awards event, emceed by Dave Ross of KIRO radio on June 2 at the University of Washington’s Kane Hall. Kiewit-General Joint Venture was the grand winner in construction for the Hood Canal Bridge project. Centennial Contractors Enterprises received the grand award for safety. GLY Construction won the AGC-Moss Adams Service to the Community Award, and Mike Lordeman of Aecon Buildings was named superintendent of the year. 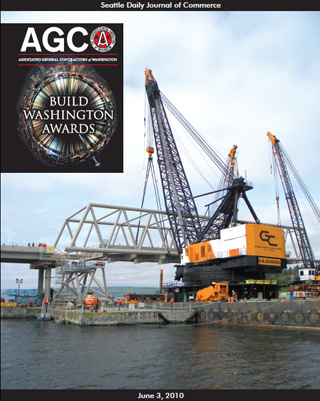 "The Build Washington Awards showcase the skill, integrity and responsibility that make AGC contractors a cut above," said AGC President Tom Zamzow. "These are just a sampling of great AGC contractors who work with public and private owners to build most of the vital and challenging projects in the state, with innovation and an emphasis on safe work sites." Construction judges were Jeff Carpenter of the Washington State Department of Transportation; Ben Minnick of the Seattle Daily Journal of Commerce; Douglas Oberst of BCRA; Peter T.S. Rasmussen of Architects Rasmussen Triebelhorn; and John Schaufelberger of the UW Department of Construction Management. Safety award judges were Wayne Brokaw of the Inland Northwest AGC; John Burdick of the Port of Seattle; Adam Gerson of OSHA Region 10; Eliot Lapidus of the AGC Oregon-Columbia Chapter; John O’Neill of Central Washington University; Anne Soiza of the state Department of Labor and Industries; and Bill Yahn of Wells Fargo Insurance Services USA. • Gary Van Loo, president, Andgar Corp.
• Dan Absher, president, Absher Construction Co.